A great way to serve steak as an app at your next party. Place all chimichurri sauce ingredients in a blender or food processor and pulse until well chopped, but not pureed. Set aside. Dissolve cayenne pepper and salt in 1 cup hot water. Transfer to a squeeze container. 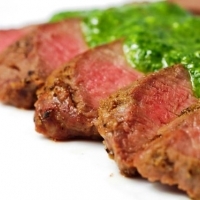 Place the steak directly over a hot grill, baste with the chimichurri sauce, and grill until the outer portion of the meat reaches the desired degree of doneness. 6 minutes per side for medium rare. Remove the steak from the grill and slice long strips from the outer edges of the steak and place it on a slice of baguette, and enjoy. Alternatively, you can grill the steak and just add the sauce at the end without basting it throughout the cooking time. I shall put forth my best,at trying my hand with this wonderful recipe. 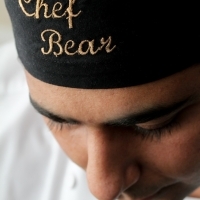 Like chefbear's recipes? Never miss an upload!